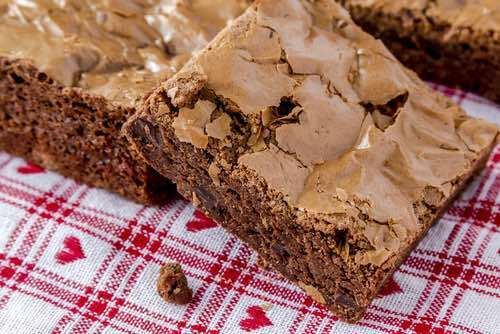 Below are Mom's homemade brownie recipes straight from her old recipe box. 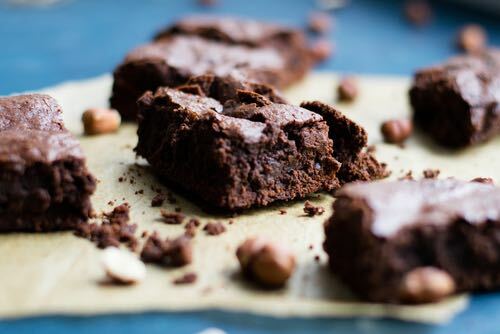 Do you love the taste of chocolatey, chewy brownies with bits of walnuts in them? Then you'll really love these. They're always a favorite treat at our house. Whenever Mom needed to quickly bake a tray of brownies to take to a family get-together, these are the recipes she used. The chocolate brownies always turned out well from the oven, and the chocolate always tasted delicious. Mom's secret to baking the best brownies was to leave them slightly underdone. Whatever you do, do NOT over bake them, and they should turn out deliciously soft and chewy every time. I can still recall the beckoning aroma of Mom's freshly baked brownies filling our old farm kitchen. I burned my tongue once because I couldn't wait long enough for them to cool before eating. Make these old fashioned favorites for your family tonight and create a fond memory. Cream 1/2 cup butter; add 1 cup sugar, mix in 2 eggs beaten slightly, add 1 teaspoon vanilla. Stir in 2/3 cup sifted flour, add 2 squares bitter chocolate, melted, and 1/2 cup nutmeats. Use an 8-inch pan lined with wax paper and bake 25 minutes in an oven preheated to 325°F. Be watchful NOT to over bake; to have them underdone is the delicious secret for making perfect brownies. Melt shortening, add sugar, then egg. Sift flour, salt, baking powder. Add nuts. Mix ingredients well together. Put in greased 8-by-8-inch tin. Bake in 375°F oven for 20 minutes, or until done. Ice while still warm. Melt 6 tablespoons cocoa and 1/2 cup butter. Add 1 cup sugar, 2 beaten eggs, 1 cup flour, 1/2 cup chopped walnuts, 1/8 teaspoon salt, and 1/2 teaspoon vanilla extract. Spread like fudge in a greased cake pan (8-inches square). Bake for 20 minutes at 325° F. Cut into squares while still hot. Here's a simple recipe for making delicious Chewy Chocolate Brownies. 1) Get the diced butter and put it in a saucepan. Put the saucepan on the hob (UK stove element) on low heat. 2) When it starts to melt, add in the chocolate pieces. Stir until all is melted. 3) When it's all melted, turn the heat off. Add the sugar, mix it, add all the flour, and mix, and then add the beaten egg. 4) Mix until slightly thick. 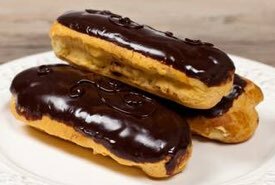 Get a tray and put grease-proof paper in it. Put in the brownie mix and put tray in oven for 25 minutes on 170°C (340°F) heat. 5) When made, put brownies in fridge for 30 minutes. 6) Take brownies out of fridge and enjoy! You'll love my Grandma Beulah's homemade brownie recipe. I spent a lot of time up at Grandma and Grandpa's house when I was a kid. They lived just a quarter of a mile from my family's home within easy walking distance. There were several great climbing trees near their house; and better yet, my Grandma Beulah liked to spoil us kids with her homemade brownies. Sometimes they had nuts in 'em, from one of the black walnut trees that grew in the back of the place, and sometimes they didn't. But either way, they were great. What I mainly liked about her brownies was that there was a thin crust on top, so when I bit in, there was a little crunch to go with the moist insides. First, cream the shortening and sugar together. Mix in the beaten egg, then stir in the melted chocolate. In a separate bowl, combine the flour, baking powder and salt, then mix that into the wet ingredients. Stir just enough to moisten the dry ingredients, then fold in the walnut pieces. Pour the batter into an 8 inch square baking pan, and level with the spoon. Bake for 35 to 40 minutes in an oven set to 350°F. Test the brownies with a toothpick — when it comes out clean, they're done. Brownies are a versatile dessert, and you can dress them up in many ways for any occasion. 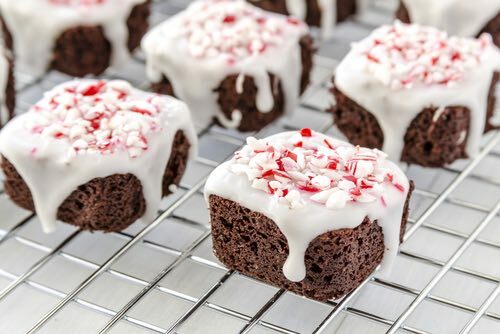 The example above shows them generously covered with white icing and topped with candy cane pieces for the Christmas and New Years.